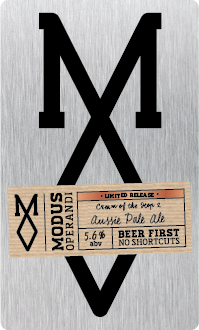 When Modus Operandi released their Cream of the Hop #1 in July, we were under the impression that it was going to be an annual brew and we wouldn’t see the follow-up until 2016. Considering that it’s only August and they’re releasing Cream of the Hop #2, we were apparently rather mistaken. The idea of this series is to use the same base beer each time but showcase a different, experimental hop. Far from being a way to trial only the latest Australian grown hops – as was the case in COTH #1 in which the hops were so fresh and experimental that they don’t have a proper name yet, instead being known for their development title of ‘HPA-35’ – the series evidently has a far broader reach as Cream of the Hop #2 uses the new American hop variety, Azacca. The hop - named for the Haitian god of agriculture, in case you’re ever asked, is apparently a small harvest hop, so there’s scarcity at play and no doubt some growers keen to see how it’s received. As for the characters it typically gives off and which you’ll find in this beer, expect to taste and smell lemon and pine. For a point of reference, Modus’ chief brewer, DJ McCready, reckons it fits somewhere between Centennial and Simcoe.